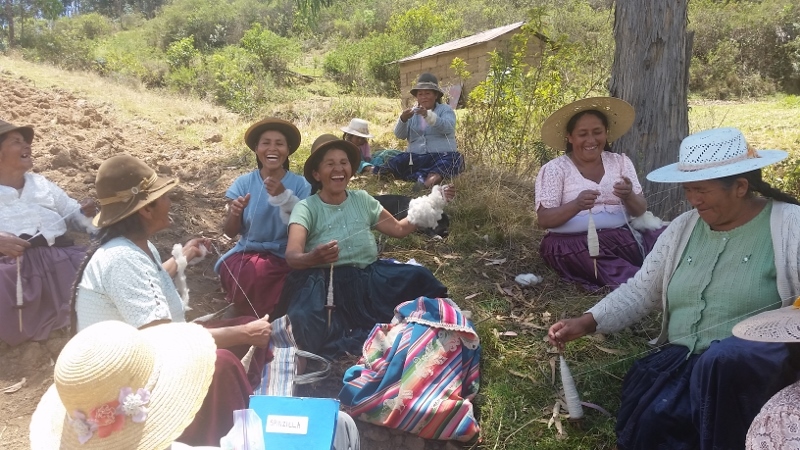 Spinzilla spinning week provides rare social occasions for the rural Andean women. Their days are normally spent lost in solitary thought as the spin following the meandering route of their grazing sheep or goats. Team captain Doña Máxima had arranged with the Huancarani spinners to meet in 1 of 4 locations on Wednesday morning. She along with her daughter and team member Vilma, Dorinda, and Shelby Deaton a social media volunteer climbed into a contracted pickup truck to check in with the Huancarani spinners. The first stop was several miles off the main dirt road that leads to the center of the community (school, Catholic Church, soccer field, and unmanned health post). Doña Julia and Doña Alicia came out from their homes spinning as they walked. Doña Máxima´s aged mother-in-law and her husband were sacking up bags of gravel and sand that a dump truck had left alongside the road. They planned to move what they needed on horseback to their home a ½ mile away for the workers who were contracted by a government development project to build outhouses at each home. The visitors and driver all looked at one another and began loading the back of the pickup, including the filled bags the elderly couple couldn´t lift. Doña Máxima and Vilma spun and chatted with the other 2 spinners while photos were snapped. The rules were reviewed and the plan for meeting in the soccer field to measure the spun yardage on Monday was discussed. The final bit of business was to have the 2 local spinners select the color and state the size for the sweater they will be awarded for participating in Spinzilla. Doña Máxima had brought along a variety of colored markers which the women used to make their color selection. 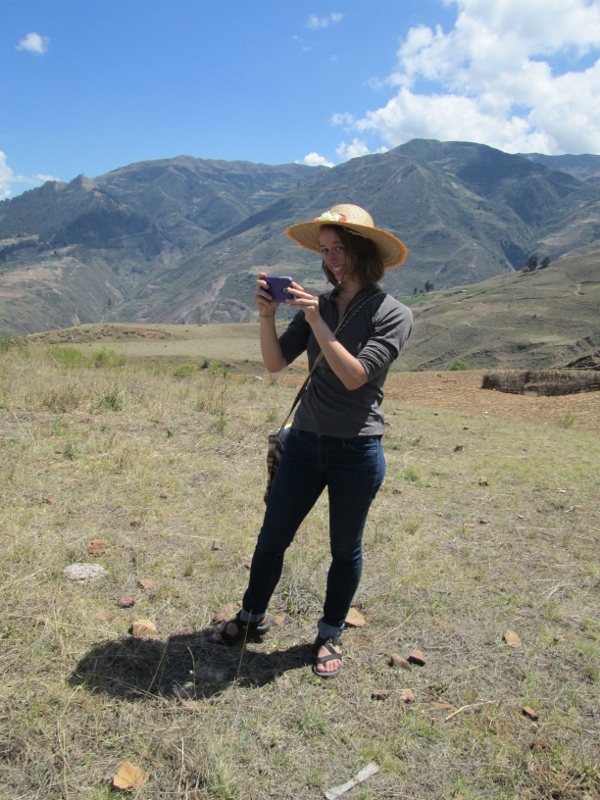 The next stop was to unload the gravel and sand for the outhouse project, then walk next door to visit Doña Narciza who is Doña Maxima´s sister and the top producing weaver. She was also the fastest spinner of the spinners queried, having filled 6 drop spindles. Because she has goats she was asked where she had procured her fleece. She said she was very pleased with the length of the fiber on the sheep skins she´d purchased from a butcher in Independencia. Doña Máxima had made a beeline upon arrival to the Tartaku (Riscinus comunis L.) bushes beside her sister´s house to pluck a number of the huge red-veined leaves. She wet the leaves in a metal tub which was filled by a trickle from a hose running downhill from a spring. She and Vilma applied the wet leaves to their shoulders to ease the growing aches from their days of spinning. There was just time for a few minutes of chatting and communal spinning before it was time to move on. The truck bumped along on its way back to the main road and then to the next stop below the center of the community. Doña Julia and her next door neighbor, Doña Dionicia, were waiting with their flocks. They spun, chatted, and picked out the color for their sweaters. 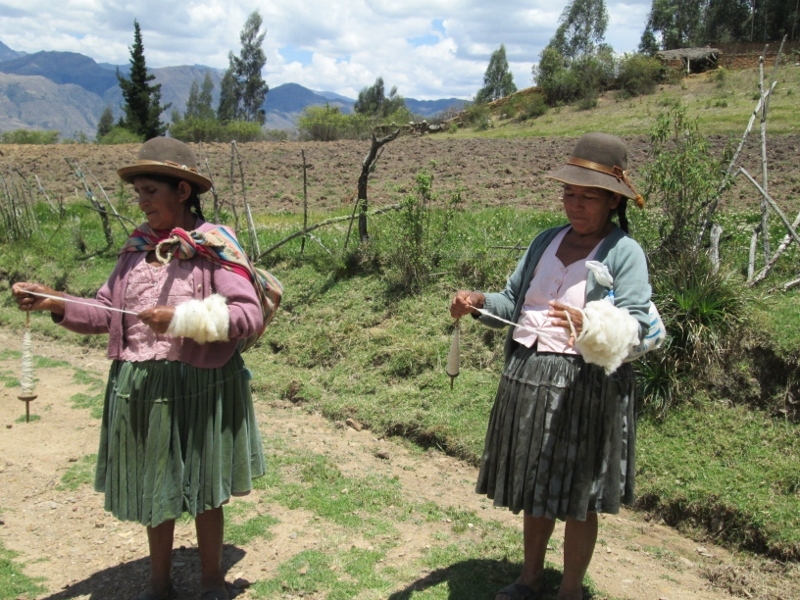 Doña Julia said she plans to sell her sheep after Christmas and devote more time to weaving. 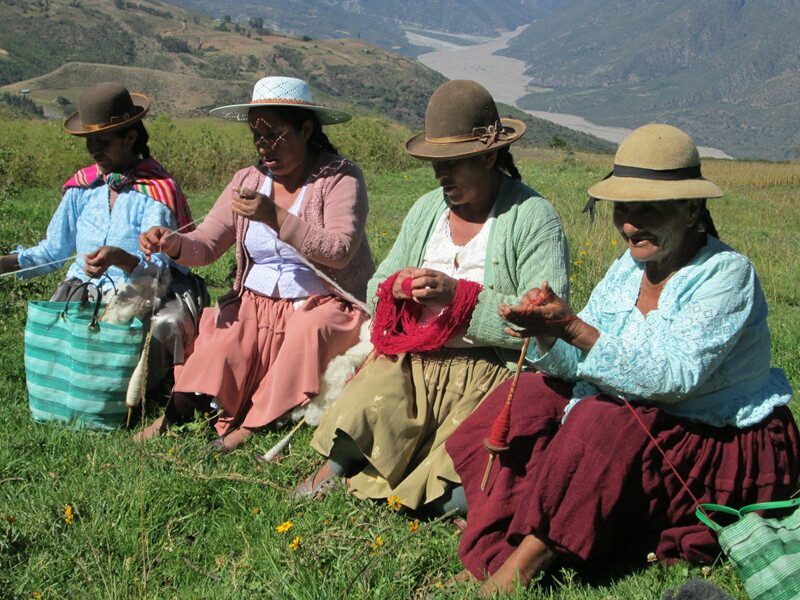 Her son, who is a doctor, requested a poncho, which she will weave with the yarn she is spinning. She´d also plans to weave to sell through PAZA. Doña Antonia and Doña Felicidad were waiting on the other side of the road, and they spun and chatted with Doña Máxima and Vilma. 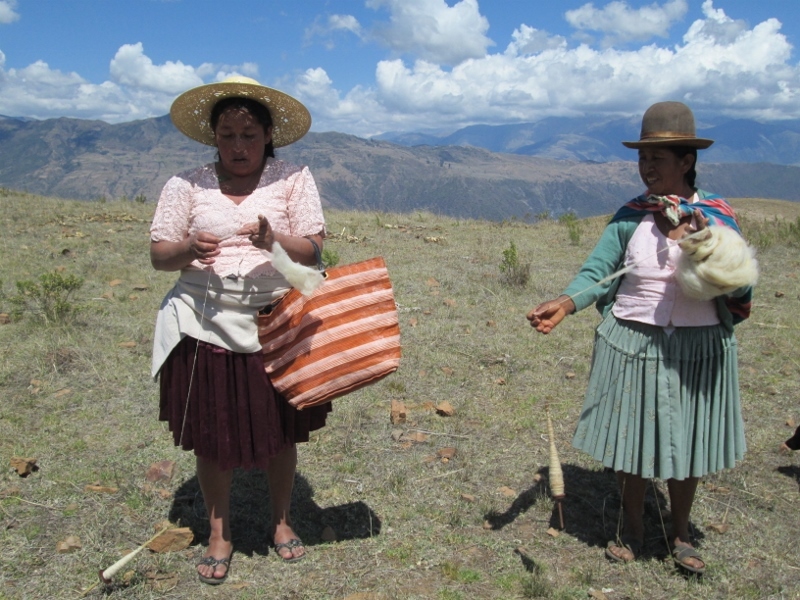 Doña Felicidad said she would be weaving ch´uspas (shoulder bags) with the yarn she was spinning to sell through PAZA. The sun was merciless, and it was a relief to find the last gathering of women sitting in the shade of eucalyptus trees. Their combined flocks of sheep were spread out in a field behind them. 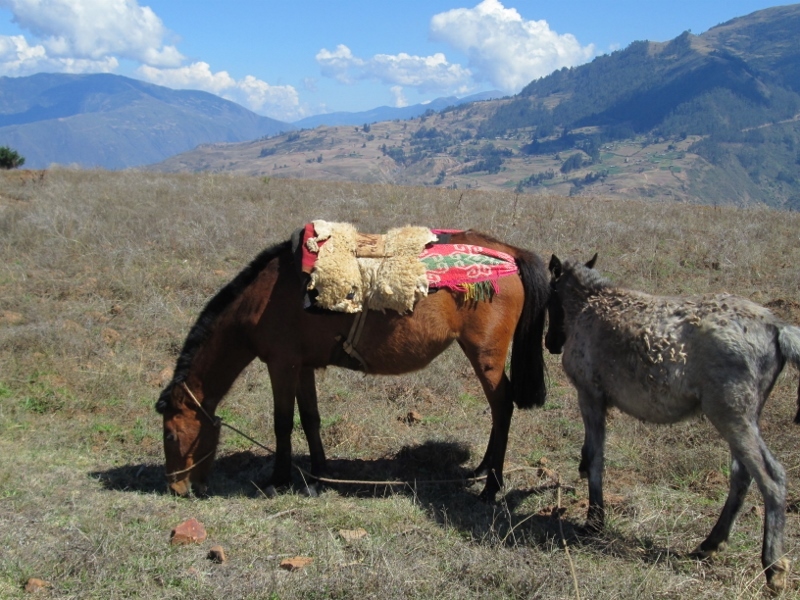 Doña Eulalia´s herd of goats were out of sight and hopefully didn’t wander as far as they did during the last meeting. 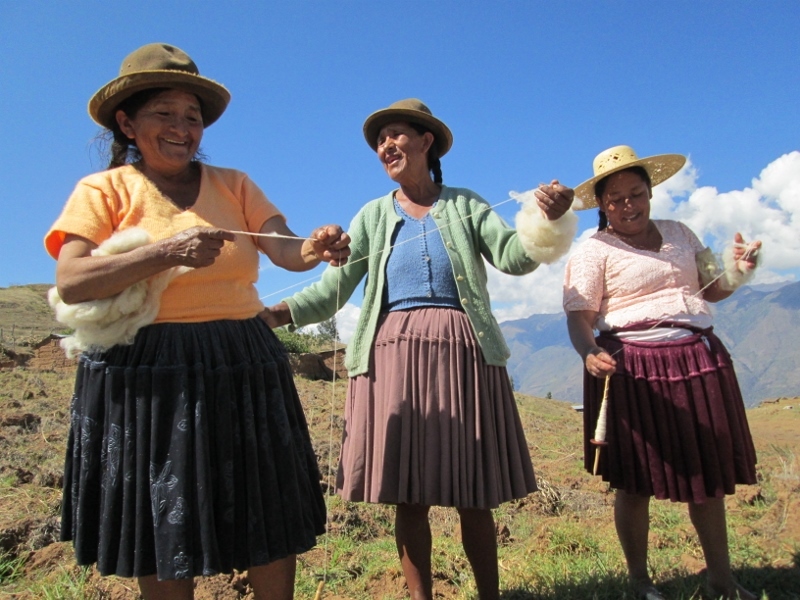 Doña Máxima and Vilma joined the group and their drop spindles began to whirl. All the spinners were spinning to weave PAZA orders. There were a lot of smiles and a lot of laughter. There was joy. The main comments throughout the day were expressions of happiness to know that there were spinners around the world spinning with them. The spinners are very appreciative of the support through Spinzilla that enabled them to participate and that made the week so special for them. They enjoyed the comments from other spinners which is a beginning in understanding that there is a larger fiber arts world outside of their isolated valley.